For other places with the same name, see Lake Victoria (disambiguation). With a surface area of approximately 59,947 square kilometres (23,146 sq mi), Lake Victoria is Africa's largest lake by area, the world's largest tropical lake, and the world's second largest fresh water lake by surface area after Lake Superior in North America. In terms of volume, Lake Victoria is the world's ninth largest continental lake, containing about 2,424 cubic kilometres (1.965×109 acre⋅ft) of water. Lake Victoria occupies a shallow depression in Africa. The lake has a maximum depth of between 80 and 84 metres (262 and 276 ft) and an average depth of 40 metres (130 ft). Its catchment area covers 169,858 square kilometres (65,583 sq mi). The lake has a shoreline of 7,142 kilometres (4,438 mi) when digitized at the 1:25,000 level, with islands constituting 3.7 percent of this length, and is divided among three countries: Kenya (6 percent or 4,100 square kilometres or 1,600 square miles), Uganda (45 percent or 31,000 square kilometres or 12,000 square miles), and Tanzania (49 percent or 33,700 square kilometres or 13,000 square miles). Geologically, Lake Victoria is relatively young at about 400,000 years old. It formed when westward-flowing rivers were dammed by an upthrown crustal block. During its geological history, Lake Victoria went through changes ranging from its present shallow depression, through to what may have been a series of much smaller lakes. Geological cores taken from its bottom show Lake Victoria has dried up completely at least three times since it formed. These drying cycles are probably related to past ice ages, which were times when precipitation declined globally. Lake Victoria last dried out about 17,300 years ago, and it refilled 14,700 years ago as the African humid period began. Lake Victoria receives 80 percent of its water from direct rainfall. Average evaporation on the lake is between 2.0 and 2.2 metres (6.6 and 7.2 ft) per year, almost double the precipitation of riparian areas. Lake Victoria receives its water additionally from rivers, and thousands of small streams. The Kagera River is the largest river flowing into this lake, with its mouth on the lake's western shore. Lake Victoria is drained solely by the Nile River near Jinja, Uganda, on the lake's northern shore. In the Kenya sector, the main influent rivers are the Sio, Nzoia, Yala, Nyando, Sondu Miriu, Mogusi, and Migori. The only outflow from Lake Victoria is the Nile River, which exits the lake near Jinja, Uganda. In terms of contributed water, this makes Lake Victoria the principal source of the longest branch of the Nile. However, the most distal source of the Nile Basin, and therefore the ultimate source of the Nile, is more often considered to be one of the tributary rivers of the Kagera River (the exact tributary remains undetermined), and which originates in either Rwanda or Burundi. The uppermost section of the Nile is generally known as the Victoria Nile until it reaches Lake Albert. Although it is a part of the same river system known as the White Nile and is occasionally referred to as such, strictly speaking this name does not apply until after the river crosses the Uganda border into South Sudan to the north. The lake exhibits eutrophic conditions. In 1990–1991, oxygen concentrations in the mixed layer were higher than in 1960–1961, with nearly continuous oxygen supersaturation in surface waters. Oxygen concentrations in hypolimnetic waters (i.e. the layer of water that lies below the thermocline, is noncirculating, and remains perpetually cold) were lower in 1990–1991 for a longer period than in 1960–1961, with values of less than 1 mg per litre (< 0.4 gr/cu ft) occurring in water as shallow as 40 metres (130 ft) compared with a shallowest occurrence of greater than 50 metres (160 ft) in 1961. The changes in oxygenation are considered consistent with measurements of higher algal biomass and productivity. These changes have arisen for multiple reasons: successive burning within its basin, soot and ash from which has been deposited over the lake's wide area; from increased nutrient inflows via rivers, and from increased pollution associated with settlement along its shores. The lake is considered a shallow lake considering its large geographic area with a maximum depth of approximately 80 metres (260 ft) and an average depth of 40 metres (130 ft). A 2016 project digitized ten-thousand points and created the first true bathymetric map of the lake. The deepest part of the lake is offset to the east of the lake near Kenya and the lake is generally shallower in the west along the Ugandan shoreline and the south along the Tanzanian shoreline. Many mammal species live in the region of Lake Victoria, and some of these are closely associated with the lake itself and the nearby wetlands. Among these are the hippopotamus, African clawless otter, spotted-necked otter, marsh mongoose, sitatunga, bohor reedbuck, defassa waterbuck, cane rats, and giant otter shrew. Lake Victoria and its wetlands has a large population of Nile crocodiles, as well as African helmeted turtles, variable mud turtles, and Williams' mud turtle. The Williams' mud turtle is restricted to Lake Victoria and other lakes, rivers, and swamps in the upper Nile basin. Lake Victoria formerly was very rich in fish, including many endemics, but a high percentage of these became extinct during the last 50 years. The main group in Lake Victoria is the haplochromine cichlids (Haplochromis sensu lato) with more than 500 species, almost all endemic and some still undescribed. This is far more species of fish than any other lake in the world, except Lake Malawi. These are the result of a rapid adaptive radiation in the last circa 15,000 years. Their extraordinary diversity and speed of evolution have been the subjects for many scientists studying the forces that drive the richness of life everywhere. The Victoria haplochromines are part of an older group of more than 700 closely related species, also including those of several smaller lakes in the region, notably Kyoga, Edward–George, Albert, and Kivu. 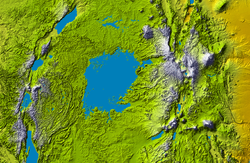 Most of these lakes are relatively shallow (like Victoria) and part of the present-day upper Nile basin. The exception is Lake Kivu, which is part of the present-day Congo River basin, but is believed to have been connected to Lakes Edward and Victoria by rivers until the uplifting of parts of the East African Rift. This deep lake may have functioned as an "evolutionary reservoir" for this haplochromine group in periods where other shallower lakes in the region dried out, as happened to Lake Victoria about 15,000 years ago. In recent history only Lake Kyoga was easily accessible to Victoria cichlids, as further downstream movement by the Victoria Nile (to Lake Albert) is prevented by a series of waterfalls, notably Murchison. In contrast, the Owen Falls (now flooded by a dam) between Victoria and Kyoga were essentially a series of rapids that did not effectively block fish movements between the two lakes. The Victoria haplochromines are distinctly sexually dimorphic (males relatively brightly colored; females dull), and their ecology is extremely diverse, falling into at least 16 groups, including detritivores, zooplanktivores, insectivores, prawn-eaters, molluscivores and piscivores. As a result of predation by the introduced Nile perch, eutrophication and other changes to the ecosystem, it is estimated that at least 200 species (about 40 percent) of Lake Victoria haplochromines have become extinct. Initially it was feared that this number was even higher, by some estimates 65 percent of the total species, but several species that were feared extinct have been rediscovered after the Nile perch started to decline in the 1990s. Several of the remaining species are seriously threatened and additional extinctions are possible. Some species have survived in nearby small satellite lakes, have survived in refugias among rocks or papyrus sedges (protecting them from the Nile perch), or have adapted to the human-induced changes in the lake itself. Such adaptions include a larger gill area (adaption for oxygen-poor water), changes in the feeding apparatus, changes to the eyes (giving them a better sight in turbid water) and smaller head/larger caudal peduncle (allowing faster swimming). The piscivorous (affected by both predation and competition from Nile perch), molluscivorous and insectivorous haplochromines were particularly hard hit with many extinctions. Others have become extinct in their pure form, but survive as hybrids between close relatives (especially among the detritivores). The zooplanktivores have been least affected and in the late 1990s had reached densities similar to, or above, the densities before the drastic declines, although consisting of fewer species and often switching their diet towards macroinvertebrates. Some of the threatened Lake Victoria cichlid species have captive "insurance" populations in zoos, public aquaria and among private aquarists, and a few species are extinct in the wild (only survive in captivity). Before the mass extinction that has occurred among the lake's cichlids in the last 50 years, about 90 percent of the native fish species in the lake were haplochromines. Disregarding the haplochromines, the only native Victoria cichlids are two critically endangered tilapia, the Singida tilapia (Oreochromis esculentus) and Victoria tilapia (O. variabilis). The extinction of cichlids in the genus Haplochromis has also been blamed on the lake's eutrophication. The fertility of tropical waters depends on the rate at which nutrients can be brought into solution. The influent rivers of Lake Victoria provide few nutrients to the lake in relation to its size. Because of this, most of Lake Victoria's nutrients are thought to be locked up in lake-bottom deposits. By itself, this vegetative matter decays slowly. Animal flesh decays considerably faster, however, so the fertility of the lake is dependent on the rate at which these nutrients can be taken up by fish and other organisms. There is little doubt that Haplochromis played an important role in returning detritus and plankton back into solution. With some 80 percent of Haplochromis species feeding off detritus, and equally capable of feeding off one another, they represented a tight, internal recycling system, moving nutrients and biomass both vertically and horizontally through the water column, and even out of the lake via predation by humans and terrestrial animals. The removal of Haplochromis, however, may have contributed to the increasing frequency of algal blooms, which may in turn be responsible for mass fish kills. The non-cichlid native fish include African tetras (Brycinus), cyprinids (Enteromius, Garra, Labeo, Labeobarbus, Rastrineobola and Xenobarbus), airbreathing catfish (Clariallabes, Clarias and Xenoclarias), bagrid catfish (Bagrus), loach catfish (Amphilius and Zaireichthys), silver butter catfish (Schilbe intermedius), Synodontis squeaker catfish, Nothobranchius killifish, poeciliids (Aplocheilichthys and Micropanchax), the spiny eel Mastacembelus frenatus, elephantfish (Gnathonemus, Hippopotamyrus, Marcusenius, Mormyrus, Petrocephalus, and Pollimyrus), the climbing gourami Ctenopoma muriei and marbled lungfish (Protopterus aethiopicus). At a genus level, most of these are widespread in Africa, but the very rare Xenobarbus and Xenoclarias are endemic to the lake, and the common Rastrineobola is near-endemic. Two species of freshwater crabs are known from Lake Victoria, but neither is endemic: Potamonautes niloticus is widespread in the lake and P. emini has been recorded from the vicinity of Bukoba in Tanzania. The only shrimp/prawn is Caridina nilotica, which is common and widespread in the lake. Lake Victoria is home to 28 species of freshwater snails (e.g., Bellamya, Biomphalaria, Bulinus, Cleopatra, Gabbiella, and Melanoides), including 12 endemic species/subspecies. There are 17 species of bivalves (Corbicula, Coelatura, Sphaerium, and Byssanodonta), including 6 endemic species/subspecies. Two of the snail genera, Biomphalaria and Bulinus, are intermediate hosts of the parasite bilharzia (schistosomiasis). Human infections by this parasite are common at Lake Victoria. This may increase as a result of the spread of the invasive water hyacinth (an optimum snail habitat), and the loss of many snail-eating cichlids in the lake. 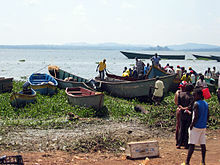 Lake Victoria supports Africa's largest inland fishery (as of 1997). Initially the fishery involved native species, especially tilapia and haplochromine cichlids, but also catfish (Bagrus, Clarias, Synodontis and silver butter catfish), elephantfish, ningu (Labeo victorianus) and marbled lungfish (Protopterus aethiopicus). Some of these, including tilapia and ningu (Labeo victorianus), had already declined in the first half of the 20th century due to overfishing. To boost fishing, several species of non-native tilapia and Nile perch were introduced to the lake in the 1950s. Nevertheless, the natives continued to dominate fisheries until the 1970s where their decline meant that there was a strong shift towards the non-native Nile tilapia (now 7 percent of catches), non-native Nile perch (60 percent) and the native Lake Victoria sardine (30 percent). Because of its small size, the abundant open-water Lake Victoria sardine only supported minor fisheries until the decline of other natives. At the peak in the early 1990s, 500,000 tonnes (490,000 long tons; 550,000 short tons) of Nile perch were landed annually in Lake Victoria, but this has declined significantly in later years. A number of environmental issues are associated with Lake Victoria and the complete disappearance of many endemic cichlid species has been called the "most dramatic example of human-caused extinctions within an ecosystem". Starting in the 1950s, several species have been introduced to Lake Victoria where they have become invasive and a prime reason for the extinction of many endemic haplochromine cichlids. Among the introductions are several tilapias: redbreast (Coptodon rendalli), redbelly (C. zillii), and Nile tilapias (Oreochromis niloticus), and O. leucostictus. Although these have contributed to the extinction of native fish by causing significant changes to the ecosystem, outcompeted natives and (in the case of the Nile tilapia) possibly hybridized with the highly threatened native tilapias, the most infamous introduction was the large and highly predatory Nile perch (Lates niloticus). The Nile perch was introduced to Lake Victoria for fishing, and can reach up to 2 m (6.6 ft) and 200 kg (440 lb). As early as the 1920s, it was proposed to introduce a large pelagic predator such as the Nile perch to improve the fisheries in the lake. At the same time it was warned that this could present a serious danger to the native fish species and required extensive research into possible ecological effects before done. These warnings primarily concerned the native tilapia O. esculentus, as the smaller haplochromine cichlids (despite playing an important role in local fisheries) were regarded as "trash fish" or even vermin by the British colonial authorities. In the following decades, the pressure to introduce the Nile perch continued, as did warnings about the possible effects of doing it. The first introduction of Nile perch to the region, done by the Uganda Game and Fisheries Department (then part of the British Colonial rule) and local African fish guards, happened upstream of Murchison Falls directly after the completion of the Owen Falls Dam in 1954. This allowed it to spread to Lake Kyoga where additional Nile perch were released in 1955, but not Victoria itself. Scientists argued that further introduction should wait until research showed the effect of the introduction in Kyoga, but by the late 1950s, Nile perch began being caught in Lake Victoria. As the species was already present, there were few objections when more Nile perch were transferred to Victoria to further bolster the stock in 1962–63. The origin of the first Victoria introductions in the 1950s is not entirely clear and indisputable evidence is lacking. Uganda Game and Fisheries Department (UGFD) officials denied that they were involved, but circumstantial evidence suggests otherwise and local Africans employed by UGFD have said that they introduced the species in 1954–55 under the directive of senior officials. UGFD officials argued that Nile perch must have spread to Lake Victoria by themselves by passing through the Owen Falls Dam when shut down for maintenance, but this is considered highly unlikely by many scientists. The Nile perch had spread throughout the lake by 1970. Initially the population of the Nile perch was relatively low, but a drastic increase happened, peaking in the 1980s, followed by a decline starting in the 1990s. Due to the presence of the Nile perch, the natural balance of the lake's ecosystem has been disrupted. The food chain is being altered and in some cases, broken by the indiscriminate eating habits of the Nile perch. The subsequent decrease in the number of algae-eating fish allows the algae to grow at an alarming rate, thereby choking the lake. The increasing amounts of algae, in turn, increase the amount of detritus (dead plant material) that falls to the deeper portions of the lake before decomposing. As a by-product of this the oxygen levels in the deeper layer of water are being depleted. Without oxygen, any aerobic life (such as fish) cannot exist in the deeper parts of the lake, forcing all life to exist within a narrow range of depth. In this way, the Nile perch has degraded the diverse and thriving ecosystem that was once Lake Victoria. The abundance of aquatic life is not the only dependent of the lake: more than thirty million people in Tanzania, Kenya and Uganda rely on the lake for its natural resources. Hundreds of endemic species that evolved under the special conditions offered by the protection of Lake Victoria have been lost due to extinction, and several more are still threatened. Their loss is devastating for the lake, the fields of ecology, genetics and evolution biology, and more evidently, for the local fisheries. Local fisheries once depended on catching the lungfish, tilapia, carp and catfish that comprise the local diet. Today, the composition and yields of such fish catches are virtually negligible. Extensive fish kills, Nile perch, loss of habitat and overfishing have caused many fisheries to collapse and many protein sources to be unavailable at the market for local consumption. Few fisheries, though, have been able to make the switch to catching the Nile perch, since that requires a significant amount of capital resources. A hyacinth-choked lakeshore at Ndere Island, Lake Victoria, Kenya. The water hyacinth has become a major invasive plant species in Lake Victoria. The release of large amounts of untreated wastewater (sewage) and agricultural and industrial runoff directly into Lake Victoria over the past 30 years has greatly increased the nutrient levels of nitrogen and phosphorus in the lake "triggering massive growth of exotic water hyacinth, which colonised the lake in the late 1990s". This invasive weed creates anoxic (total depletion of oxygen levels) conditions in the lake inhibiting decomposing plant material, raising toxicity and disease levels to both fish and people. At the same time, the plant's mat or "web" creates a barrier for boats and ferries to maneuver, impedes access to the shoreline, interferes with hydroelectric power generation, and blocks the intake of water for industries. On the other hand, water hyacinth mats can potentially have a positive effect on fish life in that they create a barrier to overfishing and allow for fish growth, there has even been the reappearance of some fish species thought to have been extinct in recent years. The overall effects of the water hyacinth, however, are still unknown. Growth of the water hyacinth in Lake Victoria has been tracked since 1993, reaching its maxima biomass in 1997 and then declining again by the end of 2001. Greater growth was observed in the northern part of the lake, in relatively protected areas, which may be linked to current and weather patterns and could also be due to the climate and water conditions, which are more suitable to the plants growth (as there are large urban areas to the north end of the lake, in Uganda). The invasive weed was first attempted to be controlled by hand, removed manually from the lake; however, re-growth occurred quickly. Public awareness exercises were also conducted. More recently, measures have been used such as the introduction of natural insect predators, including two different water hyacinth weevils and large harvesting and chopping boats, which seem to be much more effective in eliminating the water hyacinth. Other factors which may have contributed to the decline of the water hyacinth in Lake Victoria include varying weather patterns, such as El Niño during the last few months of 1997 and first six months of 1998 bringing with it higher levels of water in the lake and thus dislodging the plants. Heavy winds and rains along with their subsequent waves may have also damaged the plants during this same time frame. The plants may not have been destroyed, instead merely moved to another location. Additionally, the water quality, nutrient supply, temperature, and other environmental factors could have played a role. Overall, the timing of the decline could be linked to all of these factors and perhaps together, in combination, they were more effective than any one deterrent would have been by itself. The water hyacinth is in remission and this trend could be permanent if control efforts are continued. Pollution of Lake Victoria is mainly due to discharge of raw sewage into the lake, dumping of domestic and industrial waste, and fertiliser and chemicals from farms. The Lake Victoria basin while generally rural has many major centres of population. Its shores in particular are dotted with the key cities and towns, including Kisumu, Kisii, and Homa Bay in Kenya; Kampala, Jinja and Entebbe in Uganda; and Bukoba, Mwanza, and Musoma in Tanzania. These cities and towns also are home to many factories that discharge some chemicals directly into the lake or its influent rivers. Large parts of these urban areas also discharge untreated (raw) sewage into the river, increasing its eutrophication that in turn is helping to increase the invasive water hyacinth. As of 2016, an environmental data repository exists for Lake Victoria. The repository contains shoreline, bathymetry, pollution, temperature, wind vector, and other important data for both the lake and the wider Basin. The first recorded information about Lake Victoria comes from Arab traders plying the inland routes in search of gold, ivory, other precious commodities, and slaves. An excellent map, known as the Muhammad al-Idrisi map from the calligrapher who developed it and dated from the 1160s, clearly depicts an accurate representation of Lake Victoria, and attributes it as the source of the Nile. The lake existed and was known to many Africans in the catchment area long before it was sighted by a European in 1858 when the British explorer John Hanning Speke reached its southern shore while on his journey with Richard Francis Burton to explore central Africa and locate the Great Lakes. Believing he had found the source of the Nile on seeing this "vast expanse of open water" for the first time, Speke named the lake after Queen Victoria. Burton, who had been recovering from illness at the time and resting further south on the shores of Lake Tanganyika, was outraged that Speke claimed to have proved his discovery to have been the true source of the Nile River, which Burton regarded as still unsettled. A very public quarrel ensued, which not only sparked a great deal of intense debate within the scientific community of the day, but also much interest by other explorers keen to either confirm or refute Speke's discovery. In the late 1860s, the famous British explorer and missionary David Livingstone failed in his attempt to verify Speke's discovery, instead pushing too far west and entering the River Congo system instead. Ultimately, the Welsh-American explorer Henry Morton Stanley, on an expedition funded by the New York Herald newspaper, confirmed the truth of Speke's discovery, circumnavigating the lake and reporting the great outflow at Ripon Falls on the lake's northern shore. The Nalubaale Hydroelectric Power Station in Njeru, Uganda. The only outflow for Lake Victoria is at Jinja, Uganda, where it forms the Victoria Nile. The water since at least 12,000 years ago drained across a natural rock weir. 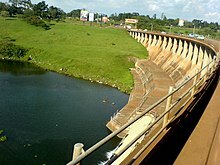 In 1952, engineers acting for the government of British Uganda blasted out the weir and reservoir to replace it with an artificial barrage to control the level of the lake and reduce the gradual erosion of the rock weir. A standard for mimicking the old rate of outflow called the "agreed curve" was established, setting the maximum flow rate at 300 to 1,700 cubic metres per second (392–2,224 cu yd/sec) depending on the lake's water level. In 2002, Uganda completed a second hydroelectric complex in the area, the Kiira Hydroelectric Power Station, with World Bank assistance. By 2006, the water levels in Lake Victoria had reached an 80-year low, and Daniel Kull, an independent hydrologist living in Nairobi, Kenya, calculated that Uganda was releasing about twice as much water as is allowed under the agreement, and was primarily responsible for recent drops in the lake's level. Since the 1900s, Lake Victoria ferries have been an important means of transport between Uganda, Tanzania, and Kenya. The main ports on the lake are Kisumu, Mwanza, Bukoba, Entebbe, Port Bell, and Jinja. Until Kenyan independence in 1963, the fastest and newest ferry, MV Victoria, was designated a Royal Mail Ship. In 1966, train ferry services between Kenya and Tanzania were established with the introduction of MV Uhuru and MV Umoja. The ferry MV Bukoba sank in the lake on 21 May 1996 with a loss of between 800 and 1,000 lives, making it one of Africa's worst maritime disasters. ^ a b Hamilton, Stuart (Salisbury University) (2016). "Basin, Lake Victoria Watershed (inside), vector polygon, ~2015" (Data Set). Harvard Dataverse. doi:10.7910/DVN/Z5RMYD. ^ a b Hamilton, Stuart (Salisbury University) (2016). "Shoreline, Lake Victoria, vector polygon, ~2015" (Data Set). Harvard Dataverse. doi:10.7910/DVN/PWFW26. ^ a b c d e f Hamilton, Stuart (2018). "Lake Victoria Statistics from this Dataverse" (Data Set). Harvard Dataverse. doi:10.7910/DVN/FVJJ4A. ^ Database for Hydrological Time Series of Inland Waters (DAHITI) – Victoria, Lake, retrieved 20 April 2017. ^ "The Victoria Nyanza. The Land, the Races and their Customs, with Specimens of Some of the Dialects". World Digital Library. 1899. Retrieved 18 February 2013. ^ Dalya Alberge (11 September 2011). "How feud wrecked the reputation of explorer who discovered Nile's source". The Guardian. Retrieved 29 December 2013. ^ Moorehead, Alan (1960). "Part One: Chapters 1–7". The White Nile. Harper & Row. ISBN 978-0-06-095639-4. ^ Stuart, Hamilton (2016-10-05). "Shoreline, Lake Victoria, vector polygon, ~2015" (Data Set). Harvard Dataverse. doi:10.7910/dvn/pwfw26. ^ a b c Stuart, Hamilton (2018-11-13). "Lake Victoria Statistics from this Dataverse" (Data Set). Harvard Dataverse. doi:10.7910/dvn/fvjj4a. ^ Peter Saundry. "Lake Victoria". ^ a b Stuart, Hamilton; Taabu, Munyaho, Anthony; Noah, Krach; Sarah, Glaser (2018-05-17). "Bathymetry TIFF, Lake Victoria Bathymetry, raster, 2017, V7" (Data Set). Harvard Dataverse. doi:10.7910/dvn/soeknr. ^ Stuart, Hamilton (2017-11-12). "Basin, Lake Victoria Watershed (inside), vector polygon, ~2015" (Data Set). Harvard Dataverse. doi:10.7910/dvn/z5rmyd. ^ Hamilton, Stuart (2016-10-11). "Shoreline, Lake Victoria, vector line – 2015 – LakeVicFish Dataverse" (Data Set). Harvard Dataverse. doi:10.7910/dvn/5y5ivf. ^ a b c d C.F. Hickling (1961). Tropical Inland Fisheries. London: Longmans. ^ J. Prado, R.J. Beare, J. Siwo Mbuga & L.E. Oluka, 1991. A catalogue of fishing methods and gear used in Lake Victoria. UNDP/FAO Regional Project for Inland Fisheries Development (IFIP), FAO RAF/87/099-TD/19/91 (En). Rome, Food and Agricultural Organization. ^ a b c John Reader (2001). Africa. Washington, DC: National Geographic Society. pp. 227–28. ISBN 978-0-7922-7681-4. ^ a b c d e f Verheyen, Salzburger, Snoeks, and Meyer (2003). Origin of the Superflock of Cichlid Fishes from Lake Victoria, East Africa. Science 300: 325–29. ^ deMenocal, Peter; Ortiz, Joseph; Guilderson, Tom; Adkins, Jess; Sarnthein, Michael; Baker, Linda; Yarusinsky, Martha (January 2000). "Abrupt onset and termination of the African Humid Period". Quaternary Science Reviews. 19 (1–5): 347–361. doi:10.1016/S0277-3791(99)00081-5. ISSN 0277-3791. ^ Simeon H. Ominde (1971). "Rural economy in West Kenya". In S.H. Ominde (ed.). Studies in East African Geography and Development. London: Heinemann Educational Books Ltd. pp. 207–29. ISBN 978-0-520-02073-3. ^ vanden Bossche, J.-P.; Bernacsek, G.M. (1990). Source Book for the Inland Fishery Resources of Africa, Issue 18, Volume 1. Food and Agriculture Organization, United Nations. p. 291. ISBN 978-92-5-102983-1. Retrieved 4 January 2016. ^ R.E. Hecky; F.W.B. Bugenyi; P. Ochumba; J.F. Talling; R. Mugidde; M. Gophen; L. Kaufman (1994). "Deoxygenation of the deep water of Lake Victoria, East Africa". Limnology and Oceanography. 39 (6): 1476–81. Bibcode:1994LimOc..39.1476H. doi:10.4319/lo.1994.39.6.1476. JSTOR 2838147. ^ R.E. Hecky (1993). "The eutrophication of Lake Victoria". Verhandlungen der Internationale Vereinigung für Limnologie. 25: 39–48. ^ a b c Peter B. O. Ochumba; David I. Kibaara (1989). "Observations on blue-green algal blooms in the open waters of Lake Victoria, Kenya". African Journal of Ecology. 27 (1): 23–34. doi:10.1111/j.1365-2028.1989.tb00925.x. ^ a b c Hamilton, Stuart; Munyaho, Anthony Taabu; Krach, Noah; Glaser, Sarah (2018-05-17). "Bathymetry TIFF, Lake Victoria Bathymetry, raster, 2016 – LakeVicFish Dataverse" (Data Set). Harvard Dataverse. doi:10.7910/dvn/soeknr. ^ "LV_Bathy". faculty.salisbury.edu. Retrieved 24 October 2016. ^ Kingdon, J. (1997). The Kingdon Guide to African Mammals. Academic Press Limited, London. ISBN 0-12-408355-2. ^ a b Spawls, Howell, Drewes, and Ashe (2002). A Field Guide to the Reptiles of East Africa. Academic Press, London. ISBN 0-12-656470-1. ^ a b c Witte; Msuku; Wanink; Seehausen; Katunzi; Goudswaard; and Goldschmidt (2000). "Recovery of cichlid species in Lake Victoria: an examination of factors leading to differential extinction". Reviews in Fish Biology and Fisheries 10: 233–41. ^ a b c d Witte, Goldschmidt, Goudswaard, Ligtvoet, van Oijen & Wanink (1992). "Species extinction and concomitant ecological changes in Lake Victoria". Netherlands Journal of Zoology 42(2–3): 214–32. doi:10.1163/156854291X00298. ^ a b c DeWeerdt, S. (28 February 2004). Dark secret of the lake. New Scientist. Retrieved 26 March 2017. ^ a b Turner, Seehausen, Knight, Allender, and Robinson (2001). "How many species of cichlid fishes are there in African lakes?" Molecular Ecology 10: 793–806. ^ J.C. Stager; T.C. Johnson (2008). "The late Pleistocene desiccation of Lake Victoria and the origin of its endemic biota". Hydrobiologia. 596 (1): 5–16. doi:10.1007/s10750-007-9158-2. ^ a b c d e f g h i j k l m n o p q Lowe-McConnell, R. (2009). "Fisheries and cichlid evolution in the African Great Lakes: progress and problems". Freshwater Reviews 2: 131–51. ^ Steeves, G: "'Haplochromis' thereuterion". Cichlid-Forum. Retrieved 28 March 2017. ^ Rijssel; Moser; Frei; Seehausen (2018). "Prevalence of disruptive selection predicts extent of species differentiation in Lake Victoria cichlids". Proceedings of the Royal Society B: Biological Sciences. 285 (1871): 1871. doi:10.1098/rspb.2017.2630. PMC 5805951. PMID 29367400. ^ a b van Rijssel; and Witte (2013). Adaptive responses in resurgent Lake Victoria cichlids over the past 30 years. Evol.Ecol. 27:253–67. doi:10.1007/s10682-012-9596-9. ^ Goldschmidt, Witte, and Wanink (1993). "Cascading Effects of the Introduced Nile Perch on the Detritivorous/Phytoplanktivorous Species in the Sublittoral Areas of Lake Victoria". Conservation Biology' ' 7(3): 686–700. ^ a b IUCN Red Lists: Geographic Patterns. Eastern Africa. Retrieved 25 March 2017. ^ Chapman, Chapman, and Chandler (1996). Wetland ecotones as refugia for endangered fishes. Biological Conservation 78: 263–70. ^ Yirka, B. (27 November 2015). Study shows evolution does not always mean more diversification. Phys.org, press release. Retrieved 28 March 2017. ^ Steeves, G: "New to the hobby Haplochromines". Cichlid-Forum. Retrieved 28 March 2017. ^ Rizza, D: "Looking At Victoria Cichlids". Conscientious Aquarist Magazine. Retrieved 28 March 2017. ^ McAndrews, R. and D.I. Warmolts (25 May 2015). "Progress in breeding freshwater fish". Boston Aquarium Society. Retrieved 14 April 2017. ^ Twongo, T.K. ; Bayona, J.D.R. & Hanssens, M. (2006). "Oreochromis esculentus". The IUCN Red List of Threatened Species. 2006: e.T15457A4587658. doi:10.2305/IUCN.UK.2006.RLTS.T15457A4587658.en. Retrieved 14 January 2018. ^ Twongo, T.K. ; Bayona, J.D.R. & Hanssens, M. (2006). "Oreochromis variabilis". The IUCN Red List of Threatened Species. 2006: e.T15458A4587788. doi:10.2305/IUCN.UK.2006.RLTS.T15458A4587788.en. Retrieved 14 January 2018. ^ a b R.S.A. Beauchamp (1954). "Fishery research in the lakes of East Africa". East African Agricultural Journal. 19 (4): 203–07. doi:10.1080/03670074.1954.11664909. ^ a b Les Kaufman; Peter Ochumba (1993). "Evolutionary and conservation biology of cichlid fishes as revealed by faunal remnants in northern Lake Victoria". Conservation Biology. 7 (3): 719–30. doi:10.1046/j.1523-1739.1993.07030719.x. JSTOR 2386703. ^ a b Tijs Goldschmidt; Frans Witte; Jan Wanink (1993). "Cascading effects of the introduced Nile perch on the detrivorous/phytoplantivorous species in sublittoral areas of Lake Victoria". Conservation Biology. 7 (3): 686–700. doi:10.1046/j.1523-1739.1993.07030686.x. JSTOR 2386700. ^ a b FishBase: Fish Species in Victoria. Retrieved 25 March 2017. ^ Cumberlidge, N. (2009). "Freshwater Crabs and Shrimps (Crustacea: Decapoda) of the Nile Basin". Chapter 27, pp. 547–61 in : Dumony, H.J. (editor). The Nile. Origin, Environments, Limnology and Human Use. Monographiae Biologicae, Vol. 89. Springer, New York. ISBN 978-1-4020-9726-3. ^ Cumberlidge, N. (2016). "Potamonautes emini". The IUCN Red List of Threatened Species. 2016: e.T44523A84352263. doi:10.2305/IUCN.UK.2016-3.RLTS.T44523A84352263.en. Retrieved 14 January 2018. ^ a b Seddon, M.; Appleton, C.; Van Damme, D.; Graf, D. (2011). Darwall, W.; Smith, K.; Allen, D.; Holland, R.; Harrison, I.; Brooks, E. (eds.). Freshwater molluscs of Africa: diversity, distribution, and conservation. The Diversity of Life in African Freshwaters: Under Water, Under Threat. An Analysis of the Status and Distribution of Freshwater Species Throughout Mainland Africa. pp. 92–119. ISBN 978-2-8317-1345-8. ^ Mwambungu, J.A. (2004). "The diversity of benthic molluscs of Lake Victoria and Lake Burigi". Tanz. J. Sci. 30(1): 21–32. ^ Senthilingam, M. (9 February 2016). "The snails spreading fever across Africa". CNN. Retrieved 16 May 2018. ^ Chege, N. (1995). "Lake Victoria: A Sick Giant" (PDF). People & the Planet. Retrieved 16 May 2018. ^ Pomerantz, J. (19 September 2015). "Haplochromine Cichlids of Lake Victoria". ecologycenter.us. Retrieved 16 May 2018. ^ Kim Geheb (1997). The Regulators and the regulated: fisheries management, options and dynamics in Kenya's Lake Victoria Fishery (Ph.D. thesis). University of Sussex. ^ a b c d e Njiru, Waithaka, Muchiri, van Knaap, and Cowx (2005). "Exotic introductions to the fishery of Lake Victoria: What are the management options?" Lakes & Reservoirs: Research and Management 10: 147–55. ^ FishBase team RMCA & Geelhand, D. (2016). "Labeo victorianus". The IUCN Red List of Threatened Species. 2016: e.T60318A47182908. doi:10.2305/IUCN.UK.2016-3.RLTS.T60318A47182908.en. Retrieved 14 January 2018. ^ a b c d e f g h i Pringle, R.M. (2005). The Origins of the Nile Perch in Lake Victoria. BioScience 55 (9): 780-787. ^ Froese, Rainer and Pauly, Daniel, eds. (2017). "Lates niloticus" in FishBase. March 2017 version. ^ a b Luilo, G.B. (August 01, 2008). Lake Victoria water resources management challenges and prospects: a need for equitable and sustainable institutional and regulatory frameworks. African Journal of Aquatic Science, 33, 2, 105–13. ^ a b c Kateregga, E., & Sterner, T. (January 01, 2009). "Lake Victoria Fish Stocks and the Effects of Water Hyacinth". Journal of Environment & Development, 18, 1, 62–78. ^ Mailu, A.M., G.R.S. Ochiel, W. Gitonga and S.W. Njoka. 1998. Water Hyacinth: An Environmental Disaster in the Winam Gulf of Lake Victoria and its Control, pp. 101–05. ^ Gichuki, J., F. Dahdouh Guebas, J. Mugo, C.O. Rabour, L. Triest and F. Dehairs. 2001. "Species inventory and the local uses of the plants and fishes of the Lower Sondu Miriu wetland of Lake Victoria, Kenya". Hydrobiologia 458:99–106. ^ a b c d e Albright, T.P., Moorhouse, T.G., & McNabb, T.J. (January 1, 2004). "The Rise and Fall of Water Hyacinth in Lake Victoria and the Kagera River Basin, 1989-2001". Journal of Aquatic Plant Management, 42, 73–84. ^ Jäger, J., Bohunovsky, L., Radosh, L., & Sustainability Project. (2008). Our planet: How much more can earth take?. London: Haus. ^ Ochiel, G.S., A.M. Mailu, W. Gitonga and S.W. Njoka. 1999. Biological Control of Water Hyacinth on Lake Victoria, Kenya, pp. 115–18. ^ Mallya, G.A. 1999. Water hyacinth control in Tanzania, pp. 25–29. ^ United Nations Environment Programme & Belgium. (2006). Africa's lakes: Atlas of our changing environment. Nairobi, Kenya: UNEP. ^ Crisman, T.L., Chapman, Lauren J., Chapman, Colin A., & Kaufman, Les S. (2003). Conservation, ecology, and management of African fresh waters. Gainesville: University Press of Florida. ^ "Water Hyacinth Re-invades Lake Victoria". Image of the Dat. NASA. February 21, 2007. ^ "Speke, John Hanning" . Dictionary of National Biography. London: Smith, Elder & Co. 1885–1900. ^ "Kenya, Africa – Lake Victoria in Kenya". Jambo Kenya Network. Archived from the original on 17 June 1997. Retrieved 14 July 2008. ^ Fred Pearce (9 February 2006). "Uganda pulls plug on Lake Victoria". New Scientist. 2538: 12. 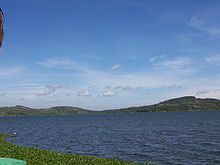 Wikimedia Commons has media related to Lake Victoria. Wikisource has the text of a 1911 Encyclopædia Britannica article about Lake Victoria.